Diabetics Dezire Presents Sugar-Less GulabJamoons. Gift one to your parents or relatives and bring the smile back into their lives. It is the ONLY Natural Sugar Substitute. All Dezire products are made using this Natural Sugar Substitute. It is Low Gycemic (GI19) Product. A Low Glycemic Product is Good for Diabetics whereas a High Glycemic Product is Bad for Diabetics. With a Low Glycemic Index of 19, it has been approved as safe for Diabetics and Health Watchers. 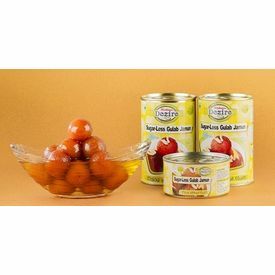 Diabetics Dezire Sugar-Less GulabJamoon Tin Diabetics Dezire Presents Sugar-Less GulabJamoons. Gift one to your parents or relatives and bring the smile back into their lives. Key Benefits of Diabetics Dezire Products It is the ONLY Natural Sugar Substitute. All Dezire products are made using this Natural Sugar Substitute. It is Low Gycemic (GI19) Product. A Low Glycemic Product is Good for Diabetics whereas a High Glycemic Product is Bad for Diabetics. With a Low Glycemic Index of 19, it has been approved as safe for Diabetics and Health Watchers. It is Insulin Independent for its Metabolism. Hence even Diabetics can safely take it. It also enables good HbA1c (Glycosylated Haemoglobin) levels. It is 1.7 times sweeter than normal sugar. Hence Calorie Savings can be made for Weight Watchers. It provides Longer Lasting Energy and thus postpones temptation to snacking. Hence Ideal for Weight Watchers. It has a Lingering Mellowed Taste unlike Artificial Sweeteners.